← Call for Submissions: Horror, Thriller, Suspense Anthology from Biff Bam Pop! The most common complaint I get from the users I work with is the presence of unwanted social content in search engines. As a rule, it’s wise to assume that anything posted online could potentially be indexed and appear in search results… no privacy setting is 100% secure. And these are just a few. Some of these I was vaguely aware of, but others came as a complete surprise: a reminder to search yourself often, just in case. When it comes to social reach and influence, the tables are turning towards user generated and curated content. SMO and social SEO will become more important as this trend grows… it’s a great time to take inventory of your presence. If you have goals for your social media activity, whether driving eyeballs or sales dollars or both, now is definitely the time to create a plan of action. 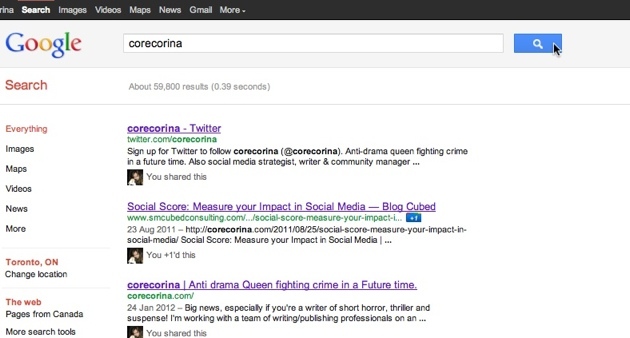 This entry was posted in Uncategorized and tagged corecorina, corina, google, remove from search, search engine, seo, smo, social media, social search. Bookmark the permalink.